This high-quality and modern hotel enjoys a privileged position close to Fiumicino Airport and the city's new exhibition centre, making it the ideal location for business guests who come to stay in Rome. This is one of the best budget hotels in Rome and is easy to reach from the A1 and A24 highways for all those who are travelling by car. The property’s dining facilities include a 24-hour bar and a restaurant open daily with a huge variety of drinks and delicious specialities that will delight even the most demanding visitors. All guest rooms boast a charming and cheery look and include all the necessary amenities and modern facilities for a truly comfortable stay, such as wooden floors and a flat-screen TV with international channels. Veio Park Hotel A warm welcome awaits you at the large, 3x000D star rated Veio Park Hotel in Roma. The hotel offers on site car parking. Guests can dine at the hotel restaurant. Meeting facilities and wifi are available. Room Features Veio Park Hotel. A hairdryer is provided in every room. We are sorry, but smoking is not permitted in either the bedrooms or the public areas of the hotel. Rooms have wireless internet access available. All rooms feature a stocked minibar. Other Info. The hotel offers an airport shuttle service. Pet owners and their well behaved pets are welcome at the hotel. A concierge service is available to guests. The hotel has disabled facilities with wheelchair access to the hotel, reception, restaurant, bar, conference facilities and disabled car parking spaces areas of the hotel. The attractive Consul Hotel is conveniently situated in the Aurelio-Vaticano neighbourhood of Rome. The Vatican City with its world-famous attractions such as the Museums, the Sistine Chapel or St. Peter's Basilica as well as the historic centre of Rome with the Spanish Steps, Trevi Fountain, Pantheon or Colosseum can be easily reached by metro. The nearest metro station can be reached either within a short stroll or a bus ride. Set in a quiet residential area, the popular hotel welcomes guests in an environment exuding peace and tranquillity. The rooms are well-appointed and decorated in a classic style. They sleep up to 4 people, and features include individually controlled air-conditioning. Most of the rooms have a terrace or balcony. Business guests will appreciate the WIFI access and the meeting facilities. In addition, there is a lovely small garden. A great hotel for those wishing to stay in a tranquil place, yet close to it all. The elegant 3-star Laurence Hotel is located in the area of Tor Vergata University, with easy and direct public transport links to the city centre - either metro line A from Anagnina or bus no. 509. A contemporarily designed property, the hotel offers 54 spacious, practical and bright guestrooms, decorated in shades of green and brown. Overlooking a lush and peaceful garden (just perfect in the summer! ), accommodation includes air conditioning, direct dial phone, safe, en-suite facilities, shower, hairdryer and courtesy toiletries. Cinema fans can easily reach the famous Cinecitta' studios by bus or metro in just 10minutes; equally those in search of something slightly different can be in Frascati or Castelgandolfo (the Pope's Summer Residence) within 20 minutes by car/taxi. The hotel's location and guestrooms are complemened by an in-house restaurant, TV lounge and bar. Guest might also note that Ciampino Airport can be reached within 15 minutes from the hotel. Hotel Iris Crillon The 3x000D star rated Hotel Iris Crillon is situated in Fiuggi. On site car parking is available. Dining is available at the hotel, which has it's own restaurant. Rooms at the Hotel Iris Crillon. Smoking is permitted in certain bedrooms (please specify when booking) and the public areas of the hotel. Additional Info. An airport shuttle service is available from the hotel. Pets are most welcome at the hotel. A concierge service is provided for guests. The hotel has disabled facilities with wheelchair access to the hotel, reception, restaurant, bar, conference facilities and disabled car parking spaces areas of the hotel. This hotel is located close to a shopping centre and a theatre. It is just 200 m to restaurants, bars and shops and links to the public transport network are to be found within 300 m from the hotel. This hotel was completely renovated in 2009 and comprises a total of 211. The. Facilities on offer to guests at this air-conditioned establishment include a lobby area with a 24-hour reception and check-out service, a hotel safe and a newspaper stand. It has a restaurant, a cocktail bar, a breakfast room on the roof terrace. The rooms come with an en suite bathroom with a shower/bathtub and a hairdryer and all are soundproofed. They are equipped with a direct dial telephone, an LCD with Pay TV and international channels and a minibar. Furthermore, individually regulated air conditioning units are provided in all accommodation as standard. This charming hotel is located on a hill, overlooking the city of Rome. The hotel enjoys close proximity to a wide range of attractions in this captivating city. Guests will find themselves just a short distance away from a number of shopping, dining and entertainment opportunities. 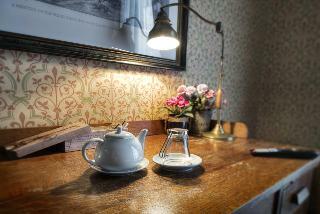 The hotel enjoys a charming design, welcoming visitors with the promise of a comfortable, enjoyable stay. The guest rooms offer a haven of peace and serenity, seemingly miles away from the bustle of daily life. The hotel's facilities and services have been designed to deliver a high level of comfort and convenience, to please every type of traveller. Ideal for business and leisure travellers, this charming hotel in the Italian capital offers the perfect place for guests to feel Rome as a local. Located in Numidio Quadrato, a southeastern area of Rome, the property is close to the Parco degli Acquedotti public park where visitors may find the popular Cinecittà, where many movies are still produced. The heart of Rome is just a 15-minute metro ride. The hotel provides a choice of rooms that feature a simple yet functional décor, providing all the necessary services to guarantee a comfortable stay. They all come with modern conveniences such as air conditioning and flat screen TV. The buffet breakfast served on the beautiful roof garden will delight even the most discerning travellers. The rest of facilities include a fitness centre and a swimming pool just 300 metres from the hotel, ideal for those sports lovers. The property consists of 50 rooms. This hotel is the perfect base for exploring the area. The hotel is conveniently located halfway between the Roman Castles and the beach, just 2 km from the center of Pomezia. The rooms are equipped with modern amenities and comfort you need to relax during your business and pleasure. Every morning our chefs prepare a breakfast with homemade pastries and cakes. 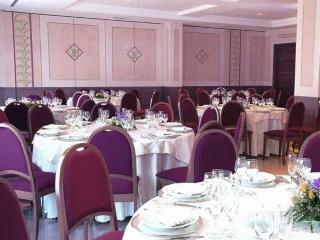 The hotel has meeting rooms with natural light where you can hold all kinds of events for up to 100 people. Room with colored furniture, ensure a perfect rest and relaxation. Outside you will discover Castelli Romani area, with its medieval towns and beautiful volcanic lakes. The Capocotta area, with its sand dunes and maquis. They will have a lot of fun in the huge Zoomarine water park, which will have a close encounter with butterflies and waterfowl. This hotel lies just 200 m from Termini Central Station, and both underground and bus stops can be found in the near vicinity. Guests will reach the majority of tourist sites in the city in only a couple of minutes. With its strategically convenient position near the airport, this hotel is a great destination for those visiting either on business and pleasure. The reception desk is open between the hours of 6.00 am and 11.00 pm and is run by multilingual staff on hand to satisfy all requests. A 24-hour parking service is also available. The rooms all come with an en suite bathroom with bath and toilet, a direct dial telephone, satellite/ cable TV, and a hire safe. The superior rooms are non-smoking and feature a Jacuzzi, a shower, a hairdryer, satellite/ cable TV, a direct dial telephone, a hire safe, a fridge, and air conditioning. A continental breakfast is available every morning. From Termini station: Leave the station from the side exit at platform 1, taking a right onto via Marsala. Then take the first left into via Milazzo, walk straight for 4 blocks, until the end of the street to reach the hotel. From Fiumicino Airport: ""Leonardo da Vinci"" Airport is 30 Km from the centre of Rome. From the airport there is a special train to Termini station (every 30 minutes). It is possible to organize a transfer by taxi from the airport to the hotel. From Ciampino Airport: Ciampino Airport is 20 minutes from the centre of Rome. The hotel can be easily reached by taxi. By car: regardless of approach, take the exit Roma-Est - A24 (Roma-L'Aquila motorway) direction Roma Centro that leads to San Lorenzo (University Area). The hotel is less than 500 m away. This appealing hotel enjoys a stunning location in Rome only a few kilometres from the Vatican. Affording a beautiful location, this hotel is surrounded by fantastic scenery. Shopping and entertainment venues are to found in the immediate vicinity. There is a public transport stop in front of the hotel. This hotel comprises a total of 67 double rooms. Guests may make use of the 24-hour reception desk and hotel safes. A number of dining options such as a café and a restaurant are available here. Business guests may make use of the conference facilities and the WLAN Internet access. A garage and car parking spaces are offered for guests' cars. The rooms are modern and tastefully decorated. In the summer the swimming pool is open. A sauna and a gym are available every day. Breakfast may be selected from a buffet each morning. Lunch and dinner may be selected from the à la carte menu. This city hotel, furnished in elegant colonial style, is usefully situated by the Rome Ring Road (G.R.A.) and within walking distance from the nearest underground station. The city center is no more than 15 minutes away with convenient transport, where guests will be able to visit some of the most famous monuments in the world, including the coliseum and the Fontana di Trevi. Ciampino airport is about 25 km away. The hotel offers a relaxed atmosphere perfect after a long day exploring the city. The hotel is easily accessible by car. It also offers easy access to the city centre by public transport (about a 30-minute journey). The nearest bus stop is about 100 metres away. Restaurants, FS Termini Railway Station, shopping opportunities, the Coliseum, The Vatican and Trevi Fountain can all be easily reached by public transport. Roma Ciampino Airport is some 22 km away, while Roma Fiumicino Airport is approximately 52 km away. This city hotel opened in March 2000. It has 81 rooms in total, spread across 4 floors. Designed to satisfy the needs of business guests and holidaymakers throughout their stay in the Eternal City, this fully air-conditioned hotel provides outstanding hospitality, impeccable lodgings, and an array of guest amenities and services. These include a lobby, 24-hour check-out service, lift access, a café, breakfast room, meeting space, conference facilities, a laundry service and airport transfers (subject to fees). Particularly suited to those travelling by car, this affordable Rome hotel offers on-site parking to guests in the form of a car park and parking garage (subject to fees). All lodgings at this affordable hotel have an en suite bathroom with a hairdryer, individually regulated air conditioning, heating, satellite TV, a minibar, in-room safe, Internet access and direct dial telephone. Rooms with disability access are available on request. Breakfast is served daily in the breakfast room. Indeed, the ample breakfast is the perfect start to a long day of sightseeing or work. Breakfast is served daily in the breakfast room. Indeed, the ample breakfast is the perfect start to a long day of sightseeing or work. From the airport, take the express train to Termini Station. From there take the metro line B to P. Mammolo, and the bus to V. le Galbani (5 stops). This hotel is located just 1 km from the town centre and 200 m from a pleasant park, restaurants and bars. Termini main train and underground station is about 800 m away and shopping venues lie within 1 km of the hotel. The river is about 2 km away. Renovated in 2001, this hotel comprises a total of 29 rooms spread over 4 floors of which 2 are single rooms and 27 are double. Guests have access to a garden and the air-conditioned hotel building features a foyer with 24-hour reception desk, a lift and a café. There is also a bar, room service and medical assistance available on request as well as parking facilities for those arriving by car. The functional rooms come with an en suite bathroom with a shower and a hairdryer. The air-conditioned units are also fitted with a double bed, a TV and a minibar/ fridge. Guests may select their breakfast from an ample buffet. Set in the Tiburtino district in Rome, 200 m from Pietralata Metro, Camplus Guest Roma features free WiFi, a gym, and modern rooms. Guests can enjoy the on-site bar and restaurant. Each room is air conditioned and is equipped with a flat-screen TV with satellite channels. The private bathroom includes Situato nel quartiere Tiburtino a Roma, a 200 metri dalla metropolitana di Pietralata, Camplus Guest Roma dispone di Wi-Fi gratuito, una palestra e camere moderne. Gli ospiti possono usufruire del bar e ristorante in loco. Ogni camera è climatizzata ed è dotata di una TV a schermo piatto con canali satellitari. Il bagno privato con articoli da toeletta gratuiti e asciugacapelli. Stazione Tiburtina è 2 fermate di metro dalla proprietà, mentre Piazza Bologna si trova a 4 km di distanza. Tiburtino è la scelta ideale per i viaggiatori interessati a monumenti, antichi monumenti e musei. This property is 2 minutes walk from the beach. Hotel Scacciapensieri is located in Nettuno, 100 m from the beach and 500 m from the Sanctuary of Saint Mary Goretti. The restaurant serves regional specialities, and most rooms feature a sea-view balcony. The Scacciapensieri is set on the first 3 floors of a tall apartment block. The hotel features 2 sun terraces, 1 overlooking the beach, and 1 with free sunbeds and parasols. The en suite rooms are air conditioned, and feature a minibar and Sky channels. Most have a flat-screen TV. Scacciapensieri Hotel offers free WiFi in the lobby and free parking. It is 5 km from the ferry departures to Ponza, and a 45-minute drive from Rome. The Scacciapensieri's restaurant also serves classic Italian cuisine. Wine tastings are available on request.